Our emissions decline while the economy grows, largely thanks to innovative technologies, showing that growth and climate action can go hand in hand. Whereas GDP grew by some 10% from 2005 to 2015, primary energy consumption decreased by almost 11% in the same period. The signal is clear – cleaner energy and economic growth can go hand in hand. What is the investment need in in the coming years? The Paris Agreement sends a clear signal to capital markets and investors – public and private – that the global transition to clean energy is here to stay. The Commission is committed to putting in place the necessary reforms to transform our financial sector. Shifting and rapidly scaling up private investment is essential to avoid the “lock-in” of fossil fuels infrastructure and carbon intensive assets and to reach the Paris agreement targets for 2030. To limit the increase in temperature to well below two degrees Celsius, Europe needs an estimated €179 billion in additional yearly investment for the next couple of decades. Public climate finance will continue to play a significant role. However, this is not enough. We need a broader range of contributions. To achieve our goals, we need to increase the flow of the private capital in green and sustainable investment. What is the EU contribution to international climate finance? The EU has shown its commitment to the fight against climate change by mainstreaming spending on climate action across all EU programmes. 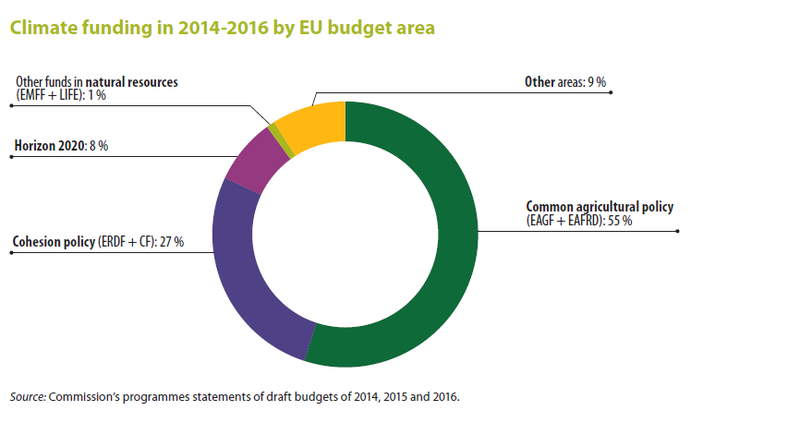 At least 20% of the EU’s budget for 2014-2020 – as much as €180 billion − should be spent on climate change-related action. Climate is integrated into all major EU spending programmes, in particular cohesion policy, regional development, energy, transport, research and innovation, the Common Agricultural Policy as well as the EU’s development policy. The EU is the biggest climate finance contributor globally. Total contributions from the EU and its member states amounted to €20.2 billion in 2016, a significant increase of 15% compared to 2015. Climate finance from the EU budget will more than double between 2014 and 2020. With an initial contribution from the EU budget of €4.1 billion, the European Fund for Sustainable Development is designed to trigger up to €44 billion of additional investments. Three of the five investment windows under the new Fund will directly target climate action. Beyond the EU budget, with the European Investment Plan, the Juncker Commission has scaled up support to attract additional public and private financing to transition to a low-carbon economy. The European Investment Plan has triggered €240.9 billion worth of investment so far through the European Fund for Strategic Investments. The energy sector is currently the first in terms of the number of approved operations and the majority of the supported projects are investments in renewable energy, energy efficiency and climate-friendly energy infrastructure. This is supported by a new rule in place since September 2017 whereby at least 40% of projects under the infrastructure and innovation window should contribute to the climate objectives. From 2014-2020, European Structural and Investment Funds (ESIF) will allocate €18 billion to energy efficiency, €6 billion to renewable energy – notably in buildings and district heating and cooling – and around €1 billion to smart distribution grids. How do other EU innovative financing instruments and Bank institutions aim to leverage private investment? European Fund for Sustainable Development (EFSD): A minimum share (28 %) of EFSD funding should support investments contributing to implementation of the Paris Agreement on climate change. The fund is established in September 2017 and the heart piece of the EU’s new External Investment Plan (EIP) targeting the European Neighbourhood and Africa and following the same approach as EFSI. European Investment Bank (EIB): The EIB is committing at least 25% of their investments to climate change mitigation and adaptation, supporting low-carbon and climate-resilient growth. In 2016, the European Investment Bank exceeded its climate action target for the seventh year running, providing over EUR 19.5 billion to help mitigate climate change and adapt to its impact. Multilateral Development Banks: Minimum commitments on investment support for climate relevant projects vary between 28% to 40%. In October 2016, the main Multilateral Development Banks issued a statement to develop together a joint climate action partnership aimed at developing a more collaborative and coherent approach that will focus on scaling up low-carbon and climate-resilient investments for sustainable infrastructure, including in particular speeding the energy transition consistent with the Paris Agreement. How does the EU generate investment in research and stimulate innovation? The Commission is boosting new investment in clean energy and climate research and innovation by increasing targeted public investment in clean energy and climate science and innovation – worth €3.4 billion in 2018-2020 under the EU’s flagship Horizon 2020 research programme. Furthermore, the EU Emissions Trading System will include two new Innovation and Modernisation funds that have the potential to generate up to €18 billion of revenue during the next decade. The revenue is intended for European industry to invest in new technologies and for the Member States to modernise their power sector and energy systems. What is the EU specific contribution towards Africa and the EU Neighborhood? The EU’s new External Investment Plan will play an important role in promoting inclusive growth and job creation in Africa and the EU Neighbourhood countries. Sustainable economic development and resilience in Africa and the EU neighbourhood are also factors in tackling the root causes of migration. The newly created European Fund for Sustainable Development will leverage public investment to trigger more private capital flows to sustainable projects. This new external instrument, adapted to the specific needs of partner countries, builds on the success of the European ‘Juncker Plan’ model which has already triggered around €250 billion of investment within the EU. Like the Juncker Plan, it will also create opportunities for European industrial and technological leadership. How is the EU mobilising action on the local level and in the regions? Under the Smart Cities and Communities initiative, the Commission has so far contributed over €270 million co-funding to projects demonstrating sustainable, cost-effective and replicable district-scale solutions at the intersection of energy and transport enabled by ICT. They bring together cities and industry to integrate and demonstrate solutions in energy, infrastructure and transport, to provide other cities with insights on how they work in practice and opportunities for replication. 36 ‘lighthouse’ cities and 42 ‘follower’ cities participate, and the partnership keeps growing. Under Urban Innovative Actions, an envelope of €371 million was granted from the European Regional Development Fund for 2015-20; first 18 winning projects starting 2016 in circular economy, urban mobility and other topics. Under the €130 million CIVITAS project, 85 local authorities are participating in innovative, integrated transport demonstration projects: micro depots in Munich, cycling and pedestrian safety in Stockholm, charging e-busses with alternative measures in Constanta, safe routes to school in Limassol – with global ‘observer cities’ benefiting from experiences. In the context of the EU Cohesion Policy, EU Member States and regions have developed over 120 smart specialisation strategies for the 2014-2020 period, with more than €40 billion allocated to regions through the European Regional Development Fund (more than €65 billion including national co-financing). Five interregional smart specialisation partnerships on bioenergy, marine renewable energy, sustainable construction, smart grids and solar energy have been launched since 2015 with the support of the Commission. About 60 regions from 20 Member States and EU neighbouring countries are participating in these partnerships. How does the EU support the Youth in the fight against climate change? The European Solidarity Corps is the new European Union initiative which creates opportunities for young people to volunteer or work in projects in their own country or abroad that benefit communities and people around Europe. Over €900m will be spent on the European Solidarity Corps and Erasmus+ for 2018-2020. The European Solidarity Corps could dedicate over €40 million to creating volunteering opportunities in the areas of environment and climate action by 2020. Additional funding transferred from other EU programmes to Erasmus+ or the European Solidary Corps could also benefit the Youth for Climate Action initiative. What is the EU doing to support mobility? Cohesion policy is funding research and development of new transport technologies and services, co-financing transport investments to the tune of €70 billion in the 2014-2020 programmes, supporting infrastructure, equipment and vehicles of the future. Under the Connecting Europe Facility, the EU’s financial mechanism supporting the roll-out of infrastructure networks, €18.1 billion has so far been committed to the rail and inland waterway sectors, as these are the two most sustainable transport modes, representing 80% of the total investment in transport infrastructure under this programme. As of November 2017, the transport sector also accounts for 9% of investment under the Juncker Plan, boosting investments in the transport sector by €22.7 billion. In the research field, over €1.8 billion has been budgeted for transport from 2014 to 2017. Support for alternative transport and the supporting infrastructure is a priority for the Commission. Up to €800 million of new EU investments will support alternative fuels infrastructure, and could leverage public and private investment of up to €4 billion. What is the role of financial sector for enhancing sustainable investment, and what has the EU done already in this area? The financial sector has an important role to play in reaching the climate change goals of the Paris Agreement and the EU’s 2030 Agenda for Sustainable Development. It is vital that more private capital is mobilised towards investments in the low-carbon economy. The European Union has been at the forefront of efforts to build a financial system that supports sustainable investments by the private sector. As of next year, the new rules on non-financial disclosure will require large companies listed in EU markets to disclose information on social and environmental aspects of their business. In June 2017 the Commission adopted guidelines to enhance transparency of companies on sustainability issues. The EU has also taken steps to incentivise pension funds and shareholders to take sustainability into account in their investment decisions. What are the Commission’s upcoming plans on sustainable finance? The Commission is firmly supporting the work on sustainable finance through the flagship project of Capital Markets Union (CMU). In December 2016 the Commission established a High-Level Expert Group on Sustainable Finance to advise on how to help the transition to a low-carbon economy, and it delivered its first recommendations for action in its Interim Report of July 2017. This HLEG is expected to deliver the Final Report by the end of January 2018. The Commission will present the EU strategy on sustainable finance by the first quarter of 2018 and will complement that strategy with adequate measures such as a proposal to integrate sustainability considerations into the duties that asset managers and institutional investors; and steps to amend capital charges for banks to boost green investments and loans. The Commission is also exploring other actions, including developing a taxonomy for sustainable finance, as well as EU standards and labels for green bonds and green investment funds. The Commission is organising a High Level conference on 22 March 2018, notably with the objective of presenting the Commission Strategy and Action Plan on Sustainable Finance. This event will be the occasion to demonstrate our commitment to the Paris Agreement objectives, and to encourage the engagement of the financial sector.